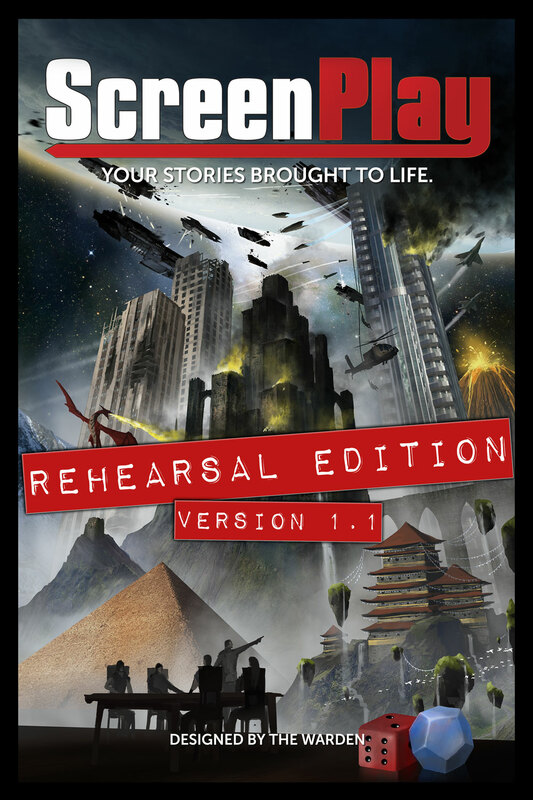 It’s been a week since ScreenPlay: The Rehearsal Edition was announced on this very site and the response has been very positive. Thanks to everyone who shared their eagerness and impatience. As we countdown to October 20th, how about a weekly tutorial on what you can expect when you begin to ScreenPlay? Before anyone thinks we’re talking about advanced rules for our upcoming storytelling RPG, let’s quash that concern. ScreenPlay is an easy-to-learn game; always has been, always will be. This is about the role of complications, those mechanical little caltrops making things harder for all types of characters in every story you can create. During the gradual building process of this game, complications went from an accessory to every dice roll to the sole purpose for the roll itself. If there’s any major difference between this game and many other tabletop RPGs on the market, it’s this: you do not roll dice to determine success or failure, you do so to determine if any complications take place. And if that peaks your interest, let’s see if we can make those eyebrows rise a little higher. Whenever a Writer or Director describes a character attempting to complicate another character’s actions, a conflict roll is triggered. Not when someone is described spinning their 1967 Mustang into a 360 degree spin, kicking down a locked door, or jumping off the roof and grabbing hold of the fire escape halfway down. In ScreenPlay, your characters are supposed to be awesome. If the main character of a big budget movie tried any of these, would you expect them to lose control and wipe out in a ditch, break their foot, or hit the ground twenty stories below? Nope, and that’s why it won’t happen here. But if the local sheriff attempts the PITT maneuver, someone stands at the other side of the door to keep you from busting in, or gunmen on the rooftop try and blast your fingers off… well then, we’ve got a conflict roll to determine complications. A complication is a forced condition, limitation, or effect placed on a character as the result of a conflict roll and can only be removed by using a number of descriptions within the scene. When you roll dice, there is still the matter of success or failure, but only as it retains to complicating a description. Hitting or exceeding the Difficulty number (based on the chosen character you’re trying to complicate) allows you to screw them up. If the roll fails, you are unable to complicate the other character’s efforts and you even run the risk of having a complication placed on you as punishment. But it doesn’t end there because there are two types of complications: major and minor ones. Which applies? Simply consult that same dice roll and break it down according to even and odd numbers and one of four possibilities will occur. Success With An Even Number: The describing character may choose to place a major complication on the target character. Success With An Odd Number: The describing character may choose to place a minor complication on the target character. Failure With An Even Number: No additional hindrances occur to the describing character. Failure With An Odd Number: The describing character takes a minor complication. Rolling odds vs. evens can be viewed like this: rolling even numbers are better, rolling odds not so much. Failing your conflict roll with an odd number is your worst possible result as it forces a minor complication on you while rolling even and succeeding provides the best possible result this game can offer. Complications are loosely defined and fully intended to allow players freedom to devise whatever they can dream up to suit the situation. Obviously, the complete rules for ScreenPlay will have more to say on this than you’ll find here (this is a teaser, after all), but here’s what we can tell you about the two types of complications. Major complications are those affecting a wide range of future descriptions for the remainder of the scene and inflict a -1 step penalty (reducing the dice type by one level, such as a d8 to a d6) unless the affected character uses two descriptions (the term for actions in ScreenPlay) for the sole purpose of addressing and “treating” the complication. For example, let’s assume someone receives the Busted Kneecap major complication. Until they remove it using two descriptions, any attempt that uses that kneecap will result in a -1 step penalty. Minor complications temporarily prevent a character from using a resource, item, set piece, or anything else that can be accessed or applied to a description. Say someone receives the The Door Is Blocked minor complication; they cannot leave through that particular door until the minor complication is removed by a single description. Less of a hassle and not always a serious detriment, but it also depends on the scene’s goal. If you need to get through that door with a legion of trigger happy terrorists trying to put a hole in your skull, it becomes a big deal. Or it can be as simple as running out of ammo, requiring you to take time to reload. It all depends on the player who sticks it on you.